The Laguna Beach community is divided over a new police car design featuring the American flag, which some residents complain is frightening and aggressive. 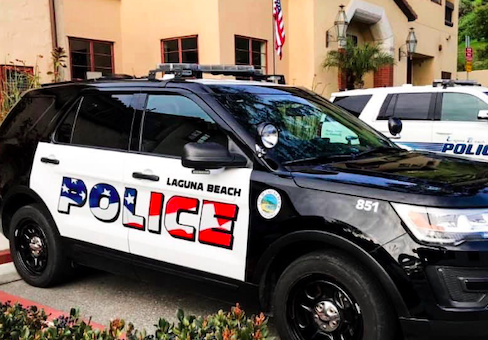 The Laguna Beach City Council decided in February to repaint the Southern California city's all-white squad cars black-and-white with the word "Police" in the colors of the American flag. But the Los Angeles Times reported Saturday that the council will reconvene Tuesday to consider reversing the decision amid complaints from residents. A local designer told the council in a March meeting that he had witnessed the new police cars spark "a little panic" when several rolled up to a Laguna Beach hotel, causing parents with children to scatter. "When one of them's there it works, but all of a sudden, I saw, wow, when there are three, maybe four of them together, folks thought it was a SWAT team, federal agents. So it had a very striking, strong impact, so much so that I think there might be some unintended consequences," he complained. "It was kind of shocking to see the boldness of the design… we have such an amazing community of artists here, and I felt the aesthetic didn’t really represent our community," another local artist agreed. "It feels very aggressive." Other Laguna Beach residents forcefully defended the flags. Local attorney Jennifer Welsh Zeiter told the Times that the backlash was due to hatred of President Donald Trump, and charged that critics of the design "cannot see through their current biases to realize that a police vehicle with the American flag is the ultimate American expression." City Councilman and local businessman Peter Blake is the most forceful defender of the design. "People are screaming that the American flag on a police car is somehow or another … hurting people's feelings who might be immigrants or visitors," he complained. "People are actually ridiculous enough to bring up comments about our cop cars having American flags on them." The controversy comes a year after California's Stanford University had a similar dust-up over a fraternity's public display of the American flag, with an administrator suggesting it could be seen as intimidating or alienating. Sigma Chi chose to respond by flying an even bigger American flag. This entry was posted in Politics and tagged California, Los Angeles Times. Bookmark the permalink.